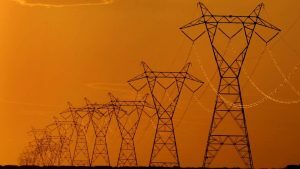 One of the country’s largest renewable energy projects—the Grain Belt Express transmission line has won approval from Missouri regulators. 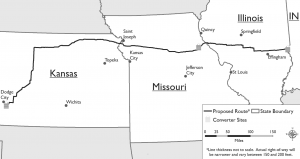 The Missouri Public Service Commission reversed its stand on the $2.3 billion project that will carry wind-powered electricity 780 miles from western Kansas, across Missouri and Illinois to Indiana. The project had twice been rejected by the Commission in earlier votes but commissioners reconsidered after a ruling last year by the Missouri Supreme Court. But it is not the final stamp of approval for the massive project that originally was started by Clean Line Energy Partners of Houston, Texas. It was in November when Chicago-based Invenergy announced it was buying the project, however the sale still needs regulatory approval in Missouri and Kansas. The Grain Belt line also needs approval from regulators in Illinois where a state appeals court last year overturned the previous approval. Clean Line started work on the line in 2010 and management indicated last year it still hoped to have the project online by 2023 or 2024. Invenergy spokeswoman Beth Conley said that timeline has not been changed by the proposed sale of the project. The power line would be the largest transmission project undertaken by Invenergy according to the Associated Press. “The Grain Belt Express is important because it is a transformative infrastructure project that will provide access to more low-cost renewable power to American consumers and communities,” Invenergy spokeswoman Beth Conley said. Paul Agathan, an attorney for the Missouri Landowners Alliance, which has opposed the project, said he is considering whether to appeal the regulatory ruling to a state court. The project also could face continued opposition from some counties, which grant approval for powerlines to cross roads, and from individual property owners.